Can Modi boost complex India-US ties? Narendra Modi's historic, landslide victory has raised hopes that the man himself and his BJP can, in power, revive India's sputtering economy and rejuvenate a disillusioned and rudderless US-India relationship. It seems ages ago now, but only a few years ago India and China were spoken of in the same breath as the dynamic, rising BRIC powers reshaping the world. No more. India now appears anemic, left in the dust by a China with a GDP and military budget four times larger, and, most telling of all, by Beijing's strategic focus and assertiveness. After the Cold War, a belief that the US and India were natural partners became fashionable in Washington. Since then the formal bilateral relationship has gone through many ups and downs. Rhetoric from successive US administrations cast India as big emerging market, as strategic partner, as essential Asian balancer (of China) and, the world's biggest democracy. The US has held an unrealistic assumption of overlapping interests, though little of the sort has emerged. India has always been a prickly, strategically autonomous actor. Even when common purpose seemed within reach, India's elite bureaucracy, still with the mindset of the Non-Aligned Movement (NAM), often obstructed potentially convergent policies. With Modi in place, the BJP-dominated central government, now led by a proven Thatcher-like and market-oriented Hindu conservative, will prompt another cycle of hype. Yet linkages between both countries remain mainly aspirational, with many unfulfilled expectations. India's post-1991 economic reforms, heavily hyped back then despite their halfway measures, have long since run out of steam. Recent visits to India reveal a nervous Indian elite, fearful of China and apprehensive about an India-US relationship that has lost its compass. With that reality, plus the difficulty of doing business in India, it's no surprise that the US-India relationship has been weighted toward defense issues, from the nuclear accord to military-to-military ties. In ways most Americans cannot see, the Indian bureaucracy remains instinctively anti-American, a complex reaction of Cold War legacy issues - India chose the losing side - and the NAM mentality. The Modi era may offer a chance to recast US-India ties in a more realist mode. To the degree Modi succeeds in re-energizing India's economy as he has done impressively as chief minister of Gujarat, he will give substance to a deeper US-India partnership. Perhaps the revival of a foundering bilateral investment treaty (BIT), or even India eventually joining the Trans-Pacific Partnership, could shape a realistic new bilateral agenda. Modi's success will depend on how effectively he empowers the private sector and how he implements the next belated phase of market-centered reforms. With nearly half of India's 1.2 billion under 26, few can even recall the 1991 reforms. India's youth bulge can be an enormous asset, or liability, depending on a fix for India's woeful general education system. Make no mistake: The new generation remains very focused on precisely that issue - jobs. The coming generation will count nearly two-thirds of India's citizens - an estimated 300 million added over the next 25 years - moving to urban areas. The infrastructure needs will be enormous. Modi is a tough-minded Hindu nationalist, and Delhi has its own reasons to be wary of China, as Modi suggested during his campaign. 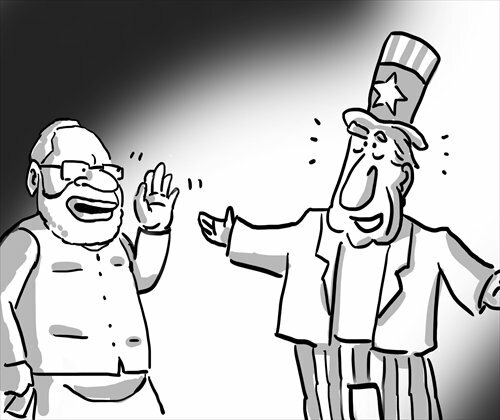 For the US, a more modest, focused and realistic agenda can put US-India ties on a more enduring foundation. Economics are critical. A robust BIT and trade liberalization is one measure of seriousness. This would deepen the stakes in both nations. On security ties, increased cyber networking and more regional naval coordination as well as defense industrial cooperation may unfold. As Modi goes, we suspect, so also will go a rejuvenated US-India partnership, one based on core interests, not romanticized wishes. Learning from nearly two decades of mixed results, both countries can build a solid, but necessarily more modest partnership than has been sought since 1991.